Despite the unpredictability of the ever-changing Web, email continues to solidify itself as a top marketing strategy with every passing year. In fact, Econsultancy’s 2014 Email Marketing Industry Census found that revenue from email increased by 28 percent year-over-year. The biggest challenge with email, however, is getting subscribers to actually open messages, as most have an influx of marketing messages delivered to their inbox every single day. That said, even when the subscriber opens a message, marketers still have the challenge of getting that subscriber to take action. Fortunately there are steps marketers can take to increase engagement with their campaigns. 1. Test the subject line. The subject line can make or break an email marketing campaign, because oftentimes it is the only thing consumers look at when making a decision to open an email message. This is why marketers must pay special attention to subject lines, and always follow best practices such as keeping subject lines short (under 50 characters) and informative. 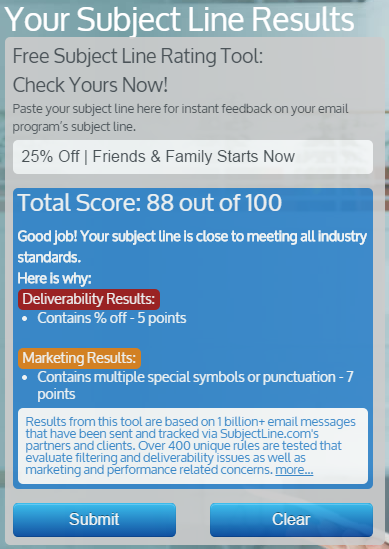 For the best results, marketers should test their subject lines, which typically can be done through a marketer’s email service provider or with a subject line testing tool, such as subjectline.com, Litmus or Subject Line Advisor powered by Touchstone. As mobile usage continues to grow, it has become very important for marketers to take the small screen into consideration when putting email campaigns together. 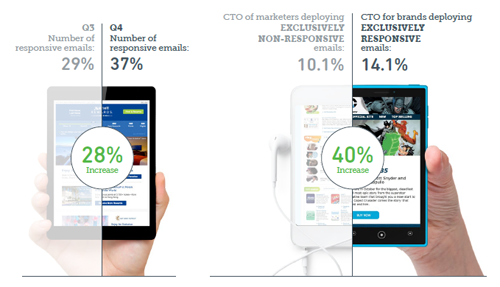 Fortunately it seems like email marketers have finally begun taking mobile seriously, as a recent Yesmail report shows that brands’ use of mobile-friendly strategies, like responsive design, resulted in mobile conversion rates jumping 70 percent year-over-year. It is also important to note that many email service providers now offer responsive templates to make it easier for marketers to optimize their campaigns for mobile. For example, Campaigner, MailChimp, and GraphicMail (to name a few) all offer mobile-friendly email templates. Consumers expect brands to deliver a personalized experience across channels nowadays, including in their inbox. In fact, Experian Marketing reveals that personalized promotional messages have 29 percent higher unique open rates and 41 percent higher unique click rates than non-personalized messages. Luckily there are many ways marketers can personalize their email campaigns. For starters, marketers can segment their lists based on consumer preferences and create campaigns specifically for each segment. In addition, companies like Monetate offer email personalization tools (see image below), including a tool for open-time personalization. With this tool marketers can deliver relevant messages for the moment the customer opens it rather than at the time of sending. 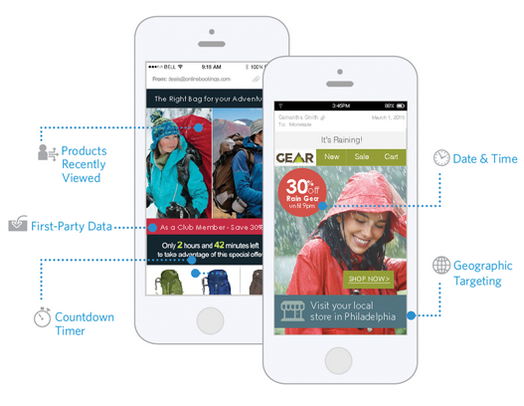 In fact, marketers can even personalize messages based on factors like the consumer’s location and weather. Email marketers can take their personalization strategies up a notch by making attempts to foster relationships with their subscribers. For instance, something as simple as a welcome email can grab a subscriber’s attention and make them feel like the marketer is making an effort to establish a relationship. In addition to welcome messages, marketers can strengthen customer relationships with birthday and customer recovery campaigns. While birthday campaigns simply aim to make customers feel special on their special day, customer recovery campaigns aim to win back inactive subscribers. Victoria’s Secret, for example, uses the subject line “We miss you so here’s 20% off your online order” to make an attempt to repair its relationship with a subscriber who hasn’t converted in a while. Not only does this message show the subscriber that the retailer is making an effort to repair their relationship, but it also motivates the subscriber to take immediate action with the 20 percent promotion (learn more about motivating subscribers below). 5. Motivate subscribers to open (and click). Take Best Buy as an example. 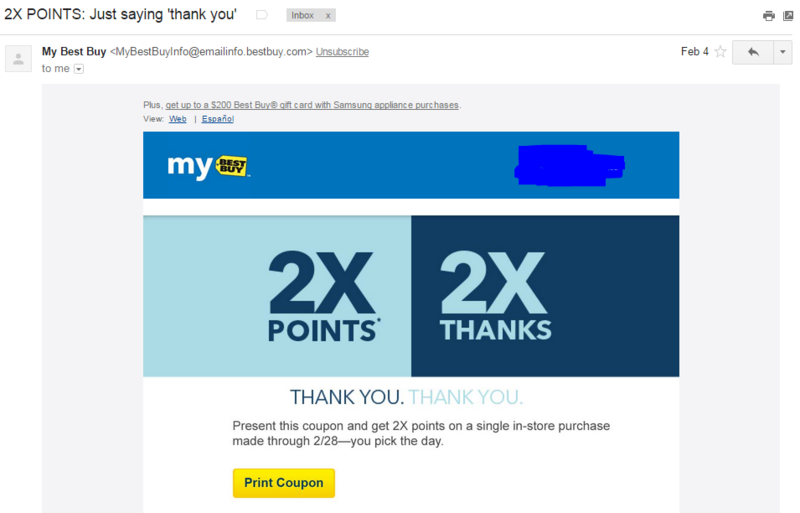 The technology retailer used the subject line “2X POINTS: Just saying thank you” to motivate its loyalty program customers to convert. Inside the email, the retailer further motivates consumers to take immediate action by including an expiration date for its promotion, which creates a sense of urgency. 6. Make content easy to consume. The layout of an email message is very important. After all, if a marketer is successful in his attempts to get subscribers to open his message, he should also be making every attempt to engage the subscriber with content that is easy to consume. This includes a clear message and obvious call-to-actions (CTAs) within the message. For help creating content that is easy to consume for email campaigns, marketers should take blogging best practices into consideration. For instance, using a list is a great way to make content more approachable and easier to read. 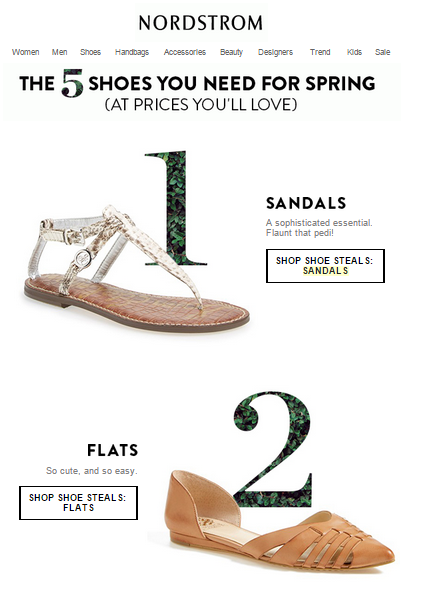 Nordstrom, for example, used a list to promote its new collection of spring shoes (see example below). The retailer used the subject line “5 Shoe Steals for Spring,” and followed it up with a list of shoes that included clear CTAs for each shoe type. In addition to creating a list, Nordstrom also made the content easy to consume by including a variety of high-quality images of products in its message. This is noteworthy because a recent Constant Contact study found that images can have an impact on email click-through rates, with data showing that business product and service companies saw the highest click-through rates in messages that had between 13 and 16 images.